The 24th World Congress of Philosophy, convened in Beijing, has held the spotlight over the past few days. Many are thinking about what the congress means for China and Chinese philosophy. With a history of 118 years, the congress is the world’s largest academic meeting of philosophy. Its significance in the most direct sense is to draw the attention of society to philosophers and their thought. With over 6,000 participants and scholars from 121 countries and regions around the globe, the congress received more than 5,000 contributed papers, covering various branches of philosophy and philosophy-centered areas of the humanities and social sciences. From these perspectives, the recent gathering is the congress’s biggest event in its over 100 years of existence. The eight-day World Congress of Philosophy offered over 1,000 sessions of different academic and cultural activities. Both philosophers and lovers of philosophy could absorb diverse and rich philosophical thinking. This was a great opportunity for them to learn from and communicate with each other as well as to broaden their horizons. Philosophy is a sphere of knowledge that is able to directly touch the deep inner being of humans. Greater mutual communication among philosophers will definitely foster a deeper and more profound understanding between China and the world. More importantly, being held in China this time, the congress facilitates Chinese philosophy’s spread globally. I am sure that starting from this congress, Chinese philosophy will be followed with growing interest. China will take the congress as an opportunity to further organize its domestic philosophical associations, departments and research institutes to conduct academic exchanges across the world. Young scholars in particular will eventually undertake this communication. 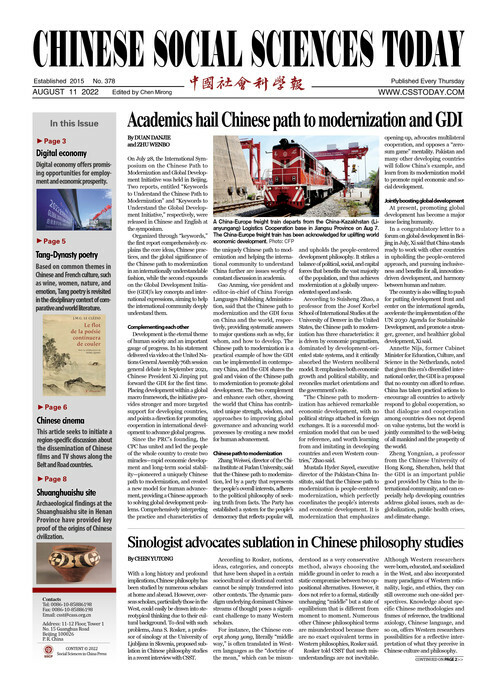 Today, many new-generation Chinese philosophers have a background in international academic communications. They possess greater advantages than their predecessors in terms of language ability, knowledge of the traditions of Chinese civilization and philosophical issues in an international context. These advantages have already become the cornerstone of philosophical communication between China and the world. Placing a premium on the future of Chinese young scholars and students in the field of philosophy, the congress set up a students’ session. I was glad to see students from both China and other countries attending this congress. They represent the future and the hope. This requires good philosophy education in universities, for which the following points are important. The first point is the integration of professional education and cross-disciplinary vision. Professional philosophy education is philosophy education in a narrow sense, and cross-disciplinary vision enables the combination of philosophical branches with other disciplines. Meanwhile, the exploration of philosophical issues and the study of the history of philosophy should be combined in the schooling. The second point is to heighten consciousness of foreign languages and other civilizations. Living in their native-language environment, Chinese scholars should endeavor to deeply understand other languages and civilizations, especially as China is becoming an increasingly important country. The third point is to prioritize both historical and far-sighted views. History enables us to know where we came from. Meanwhile, one’s view of the future is necessary, because it addresses the problem of where we are heading. The fourth point is to be further engaged in reality. In regard to the problems of reality, philosophers may not offer one certain, standard answer. However, the mere reflection on the problems themselves has positive effects, which at least opens more possibilities to us. Wang Bo is vice president of Peking University and executive president of the Chinese Organizing Committee of the 24th World Congress of Philosophy. This article was translated based on the interview and compilation by Guangming Daily reporters Jin Haotian, Wang Jin and Zhang Yingtian.